Replacement UML automatic inflation cartridge only (without CO2 cylinder). 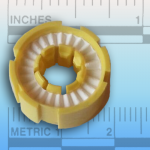 This inflation cartridge triggers inflation of dan buoys, life rafts, and inflatable life jackets with UML Pro Sensor inflation mechanisms. 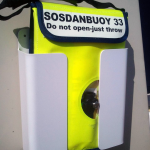 Replacement of this cartridge in your SOS Marine dan buoy is recommended every third year, but in heavy tropical climate, annual replacement is suggested. 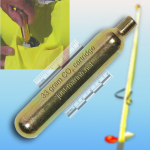 In typical use, to service your dan buoy after training or rescue deployment, you need a complete recharge kit, with CO2 cylinder and inflation cartridge. The inflation cartridge alone is not sufficient to rearm the dan buoy. Buy just this cartridge if yours is lost but your CO2 cylinder is still within its service life. 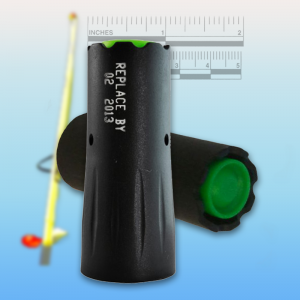 This replacement inflation cartridge is the same part included in your SOS Marine dan buoy with UML Pro Sensor inflator. It’s included in the dan buoy recharge kit for devices with that inflator. Every third year replacement is suggested; you can install it yourself. 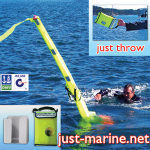 After you throw the dan buoy into the water, a paper element inside the cartridge dissolves within seconds, which allows a spring loaded mechanism to puncture the CO2 cylinder. Within seven seconds, the SOS Marine dan buoy self inflates. For complete dan buoy information, including a user manual with servicing instructions, click to the man overboard buoy page.